This is a versatile design, that allows a change in the appearance by the different color combinations. With a front seperating zipper opening, two pleats on each side, soft gathers in the back and a stand up collar. 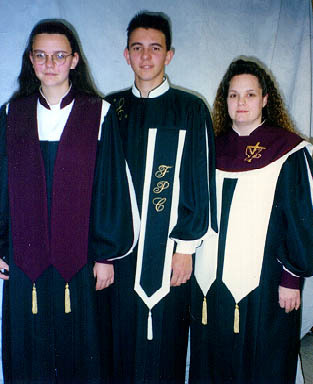 Your choice of sleeves makes this a good design for your choir. removeable sash is also included. with a long V in back and a tassel accent.